So, my observations regarding the ancestries in Pathfinder Playtest have been ninja’d by the release of the v.1.4 changes, which means that I have to go over A LOT of notes once more. In the meanwhile, consider this to be my addendum to the observations in my post on ancestries. In case you haven’t seen it, you can find my original post here! Now, the first thing I really enjoyed here would be that ancestries matter more. The double choice of 1.4, i.e. the fact that we get to choose a heritage and an ancestry feat at 1st level, translate to a more pronounced differentiation. That’s a very good thing in my book. I am also pretty positive about dwarves losing unburdened and making it a heritage instead. Those are good changes. I also welcome the inclusion of higher level ancestry feats that allow further differentiation at higher level regarding ancestry-tricks. Gnomes getting a speed upgrade is a good thing, and the heritage/ancestry-change means that half-elves and half-orcs are no longer all the same at level 1. The slight power-upgrade for halflings is also very much appreciated. Those are definite improvements, as far as I’m concerned. That being said, if we take the ancestry feats into account, we’ll still notice a discrepancy in power between a few of them; Elf Step, the new 9th level ancestry feat for elves, for example, can in the long run add a whole tactical dimension, while Guiding Luck, in comparison, feels less impressive. Nonetheless, high-level ancestry feats are definitely a good step in the right direction. From a rules-language perspective, Elf Step already is one of the significant flexibility-boosting feats that X pdfs will forget about existing, resulting in potential cheeses. Thus, while I do consider this to be an improvement and now opens up much needed design space for future races to be released, the ancestries, as far as I’m concerned, don’t align perfectly on a power-curve at this moment. I foresee another problem, particularly for half-orc and half-elf and the similar, inevitable hybrid ancestries, at higher levels: Previously, the prohibitive cost of being one of these fellows was the price to pay for the ancestry-feat flexibility at higher levels. This drawback is now gone, and the two thus get to cherry pick from 2 lists of ancestry feats. This wouldn’t have been an issue previously (or at least, less of an issue! ), but the design-paradigm has changed to include more potent higher-level ancestry feats, which can and will produce issues sooner or later during the game’s lifespan. A limitation caveat for the cherry-picking of these options is something I’d very much suggest to be implemented for half-breeds. It is unsurprising that, at this point, flavor-concerns are not addressed. However, as a person, I sincerely hope that the default speed value is changed back to 30 ft. Not only because it makes the job for those of us, who, like me, think in the metric system, easier – it’s also a matter of retaining a part of Paizo’s target demographic, as one of my readers remarked in an e-mail. 30 ft., or multiples thereof, are pretty much the default speed of a TON of different roleplaying game systems. From the mainstream iterations of D&D to a metric ton of old-school retroclones, there are a gazillion systems that assume a 30 ft. movement rate and the grids such systems feature, if any, the dimensions of traps, corridors, etc. are often based on these values. Now, sure, movement rates aren’t the toughest things to modify for a character, but they carry a long tail of magic modifications etc. with them, and as a GM, judge, etc., a deviation there could mean that certain dungeons eand effects no longer run as smoothly and require work where they previously didn’t. But why would Paizo care about that? 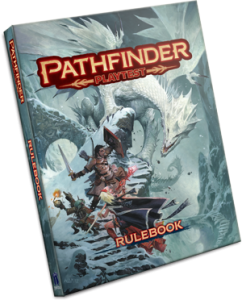 Well, at least judging from the folks that contacted me, there is a target demographic of folks that love the Pathfinder adventures, but that don’t like the system, perhaps due to time-constraints emphasizing a more rules-lite gaming to get more out of a session; perhaps due to other personal tastes. I have been asked time and again by 5e GMs to recommend some amazing Pathfinder adventure in both 1st and 3pp circuits. There also are quite a few GMs that prefer the facility of rules-lite OSR-systems, but who nonetheless enjoy Paizo’s story-driven APs over traditional old-school dungeon-crawling and module design. There are plenty of folks that play the adventures, but not the system. Granted, those folks are not the central target demographic of Paizo, and I have no idea how many such groups there are out there, but they do exist, and judging from the requests and responses I received over the years, there seem to be more of these groups out there than I anticipated. Backwards compatibility to PF 1 is also something that’s hampered with this decision – though that may well be intentional. So yeah, still not sold on the speed base values. If you enjoy my articles and want to support what I’m doing, please consider supporting my patreon – it directly influences how much time I can devote to reviewing. You can find it here!